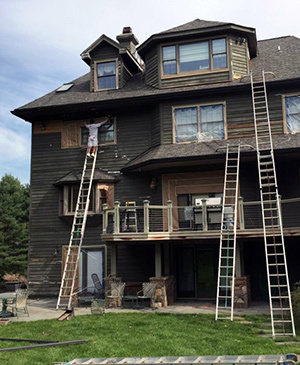 Exterior painting of 2 story colonial (2 coats) with caulking, repair and replacement of rotting window frames and trim; power washed and solid color staining of a large screen porch and deck; replacement of section of porch screen; replaced damaged siding and missing soffets from wind storm. "David Wockenfuss had a team of very experienced and efficient workers who completed the job over 3 days. He was present for most of the work and ensured that everything was perfect. Although they were not the lowest bid, they were able to handle more than just painting (e.g. several widows had frame components that needed replacement) so that I didn't need to involve additional companies. The finished product was definitely worth the price. They are coming back this winter to do some interior painting."